This simple dough recipe, almost as old as time itself, makes wonderful “flat bread.” Flour, yeast, salt, and olive oil. You can’t get more basic, easier or inexpensive. This recipe runs pennies, about 50 cents for eight to ten. At my store, six sell for $4.99. Super Easy Flat Bread – each a work of art. That’s “code” for not perfectly round! This is basically the same as pizza or pita dough, although pizza dough usually is a little stiffer, just add another half cup or so of flour to make two 10 to 12 inch rounds. Pita is the same dough, only baked in a hot, hot oven where it puffs beautifully. Speaking of pizza – left over flat bread makes a perfect home-made “boboli” type crust; no “knead” to pay an arm and a leg – everyone can have their own individual pizzas. (I feel like I have to apologize for that pun…) Store extra tightly wrapped in the fridge. 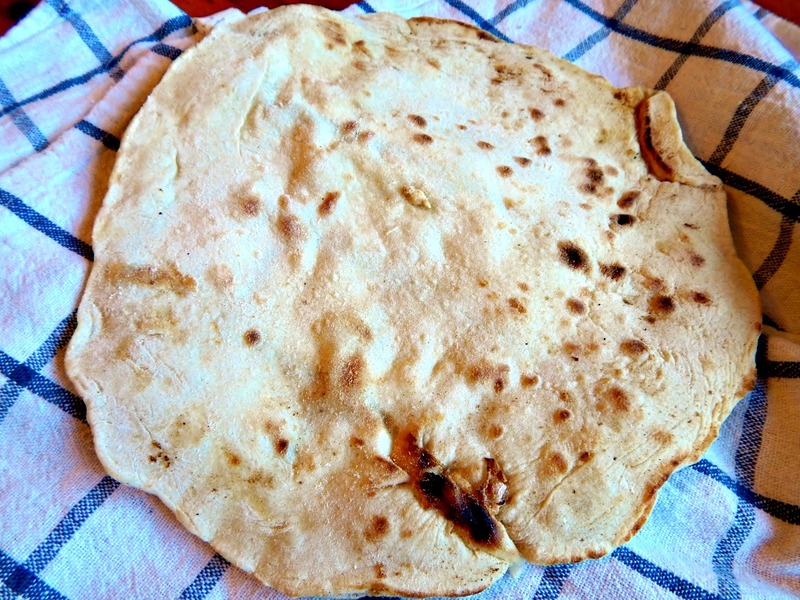 Flat bread can also be made crispy by cooking a bit longer or by drying in a hot oven. Break it up and use it as chips for your favorite dips. Use Flat Bread, too, as a lovely wrapping for a Falafel Sandwich. Just one more note: This same recipe also makes wonderful “Fry Bread.” Heat about 1/2 inch of oil in a cast iron skillet over medium heat, stretch or roll your dough out into a five to seven-inch round, a hole in the middle is traditional – and fry about 3 to 4 minutes per side. Press down the dough a bit as it cooks. Divide dough and roll into little balls. Place on flour. Let rest. By hand: Combine everything in a work bowl, holding back 1/4 cup of flour. Mix with a wooden spoon or your hand until everything is moistened. Working with your hand, begin the kneading process in the bowl, then turn out on to counter with a bit of the reserved flour. This will be a very sticky dough – use a bench scraper of a spatula to keep pulling the dough back up off the counter as you knead it. Knead for about five minutes, then place a bowl over the dough and rest it – this will let some of the flour absorb the moisture and make it less sticky. After the rest period, begin to knead. This is a wet dough, but add more flour or water if necessary while kneading, trying to keep any additions to a minimum. Knead for about five to ten minutes, until the dough is smooth – it will still be slightly sticky. By Mixer: Combine flour, yeast and salt in the work bowl, using a paddle attachment and low speed, mix together. Add the wet ingredients and mix on low speed until ingredients are all incorporated. Change paddle out for a dough hook and mix for about 10 minutes on medium. Add more flour or water if necessary, trying to keep any additions to a minimum. The dough should be pulling away from the sides – it will be a bit sticky to the touch, but should be smooth. Food Processor: Combine flour, salt and yeast, pulse. With the motor running, add the oil and water. Process for five to six minutes. Add flour or water as necessary. The dough is finished as it starts to pull away from the sides and is smooth. Note on food processors: I use the food processor a lot for dough; it’s always on my counter and I hate having to drag out the big mixer. My food processor is not a large one and after a few minutes it starts to heat and struggle. I watch it carefully, each dough varies, even the same recipe. If the work bowl feels warm to the touch or the blade is starting to lift, I turn the dough on to a floured counter and knead a minute or two by hand to finish. Using an oiled spatula, place in an oiled container to rise. Mark the container with a bit of tape or sharpie, so you’ll know when it’s doubled. Spray the top of the dough with oil. Place on the counter to rise for about an hour or in the fridge for overnight or eight hours or so. You’ll want to check after the first hour or two in the fridge – if it’s started to rise, press it back down to the original line. You don’t want to look in your fridge eight hours later to find dough has oozed out and taken over! Place dough on lightly floured counter, and with a serrated knife, cut into 8 to 10 equal pieces. Form the dough into balls, then lightly flatten. I like to use my hand as a “cage” for the dough and just roll it around on the counter until it forms something of a ball, then flatten. As you flatten, you’ll feel the dough resist – don’t over stretch it, it will rest now, under a damp cloth for about five minutes if the dough is at room temperature or about 20 minutes if it’s been refrigerated. The dough will relax and be much easier to work with. If you’re a perfectionist, feel free to weigh the dough and divide by a scale – personally I think that each of these will be an individual piece of art – size and shape may vary, and just adds to the charm. These are easily shape by hand, just like with a pizza dough. Place each ball on to a heavily floured surface and with floured hands, push the edges of the dough out with fingertips. Add flour as needed. Just like with pizza dough, feel free to pick up each round and let it gently stretch from the weight of the dough, turning several times. If the dough becomes resistant and it doesn’t feel like it is stretching well, just cover for a moment or two and let it relax before proceeding. Let the flat bread sit on the floured counter, uncovered, for about 10 minutes, if desired, or simply form one, then cook one, then continue in this fashion. Preheat cast iron skillet or griddle over medium heat. Brush skillet or griddle lightly with oil. Place the flat bread in the skillet and cook on the first side for about a minute. Turn with a thin spatula and cook the other side for two to three minutes. When the flat bread is first laid in the skillet, there will be a very small window of opportunity, like a tenth of a second to make a minor adjustment like nudge closed a small hole or push out an edge. Be very careful if you attempt this. It may take one or two to get the temperature just right. You’re looking for a cooking time of about three minutes, which should be just long enough to get a few brown spots while cooking the dough through. If your dough is thicker, you may want to turn again, just to make sure it’s cooked all the way through, rather than just doing one turn and risk the bread becoming overly browned. If you’d like to cook in the oven, preheat oven and pizza stone or cookie sheet to 475 degrees. Bake for about three minutes. Sometime mine come out great – sometimes, well, not so much – but they all taste wonderful! This entry was posted in Click here for Fabulous Food Posts and tagged Bread, Easy Recipe, Flatbread, Frugal Hausfrau, Heritage Recipe. Bookmark the permalink.